The anti-corruption movement worked together to stop a special interest attack and keep this November's most impactful anti-gerrymandering measure on the ballot. You should really see this: https://act.represent.us/sign/michigan-victory?source=taf . RepresentUs has a smart plan to fix our broken political system. Check it out. The people just won a major victory in the fight to pass anti-gerrymandering laws at the ballot this year. A dark money group tried to attack the measure by suing to remove it from the ballot in Michigan - but the anti-corruption movement fought back, hard, and kept it on the ballot. Now the voters get to decide whether to end gerrymandering in Michigan. This huge grassroots pushback against this lawsuit from special interests shows us that if we work together, our movement can put politicians in their place and fix our broken system, one campaign at a time. The Dark Money Attack Was Designed to Remove America's Most Impactful Anti-gerrymandering Measure From the November Ballot. The anti-gerrymandering initiative at stake in this lawsuit was approved for the ballot after 425,000 voters signed a petition in support of bringing it to a vote this November. The campaign is led by Voters Not Politicians, a grassroots nonpartisan coalition of thousands of volunteers in Michigan. The initiative would establish an independent citizens redistricting commission instead of allowing self-interested politicians to choose their voters. There are a handful of other states with anti-gerrymandering measures on the November ballot, but Michigan is the state with the most gerrymandered seats in Congress. So it's no surprise that special interests were ready with an attack to stop the people from voting on it. Before the initiative even qualified for the ballot, the Michigan Chamber of Commerce, chaired by Deloitte's Mark Davidoff, backed a lawsuit to remove the measure from the November ballot. The Michigan Chamber of Commerce has a PAC that fights ballot measures. That PAC received more than half of its contributions from Canadian-based energy conglomerate Enbridge. 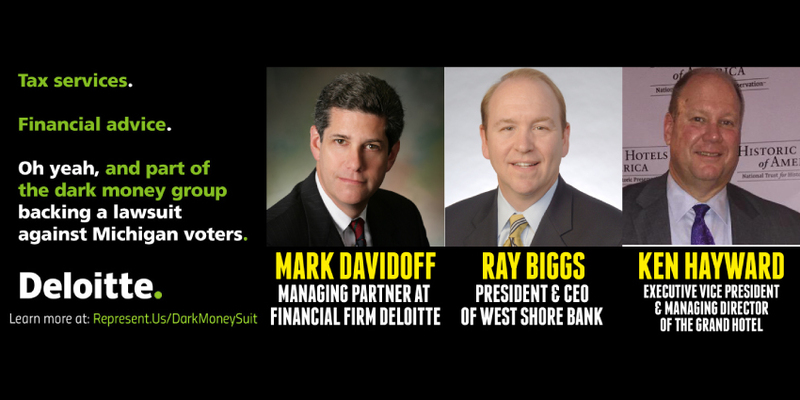 The Chair of the Chamber is Mark Davidoff, a Managing Partner at Deloitte, a global financial services firm. In Michigan, Deloitte has received more than $400 million worth of active government contracts. The Chamber-backed legal challenge was unanimously rejected by the Michigan Court of Appeals. Two of the judges on the Michigan Supreme Court, which heard the case on July 18th, have ties to the Michigan Chamber of Commerce. Thousands of Us Joined the Campaign Fighting Back. We weren't about to let a dark money group silence the voters with this self-interested lawsuit. So we took action immediately to demand that Mark Davidoff, the Chair of the Michigan Chamber, drop the lawsuit and let the people vote. We sent nearly 5,000 petition signatures to Mark Davidoff urging him to drop the lawsuit. We spread news of the attack to more than 1.5 million people with videos, press coverage, and a social media campaign raising the alarm about the attempt to stop the people from voting. We went in person to Deloitte's offices in Detroit and across America to demand dark money group Chair Mark Davidoff drop the lawsuit, prompting media attention and forcing Deloitte and the dark money funded Chamber to go on the record in support of gerrymandering reform. We publicly exposed financial mega-corporation Deloitte for their support of the group backing the lawsuit by launching digital advertisements and driving public posts on Deloitte's social media properties to hold them accountable. We published newspaper ads across the state to expose Mark Davidoff and other members of the Chamber, so voters would know who was responsible for this disgusting assault on voter rights. We Got Their Attention - And They Didn't Like it. Our first clue that we were getting the Chamber's attention was a phone call from Mark Davidoff. Davidoff called Represent.Us offices multiple times to try to avoid taking responsibility for the lawsuit and ask us to stop putting his face on the internet in connection with the case. 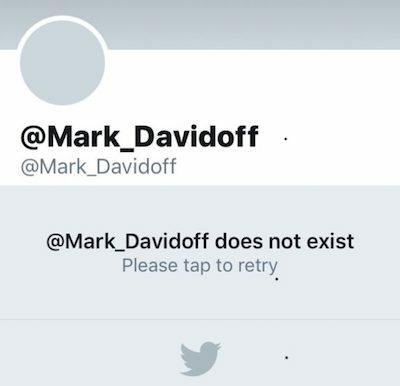 Davidoff even shut down his Twitter profile to avoid the pressure online. Then the Michigan Chamber of Commerce released a statement claiming they don't support gerrymandering. See the full corrected statement here. When They Didn't Drop the Case, Hundreds of Us Showed up to Demand the Court Let us Vote. The Michigan Supreme Court held a hearing for the case on the morning of July 18th - and on that day, we made sure the Court heard our message loud and clear: Let us Vote! We aired radio ads exposing the opposition and drove a billboard truck outside the Capitol and Court buildings. And hundreds of Michiganders stormed the plaza in front of the Court building during the hearing to demand that the Court let the people vote. And we did it. So what's next? The deck was stacked against us. The Chamber and its funders have deep pockets, and powerful allies. But in spite of that, and in spite of the Court's ties to the Michigan Chamber of Commerce, the people were able to win. Thousands of us joined together and showed the court that America was watching, and we won't let special interests silence the people. So what's next? The Court's ruling means that the anti-gerrymandering initiative will stay on the ballot this November, allowing the people to decide whether they want to end gerrymandering. But that doesn't mean the campaign is over. If opposition showed up before the measure even made it to the ballot, it's very possible that special interests are scheming right now to do everything they can to spread misinformation about this measure and prevent it from passing. If you're interested in getting involved in the campaign, visit Voters Not Politicians to learn more and find out how you can help. We're going around Congress to pass local laws and resolutions to fight corruption. Sign up to join the fight.